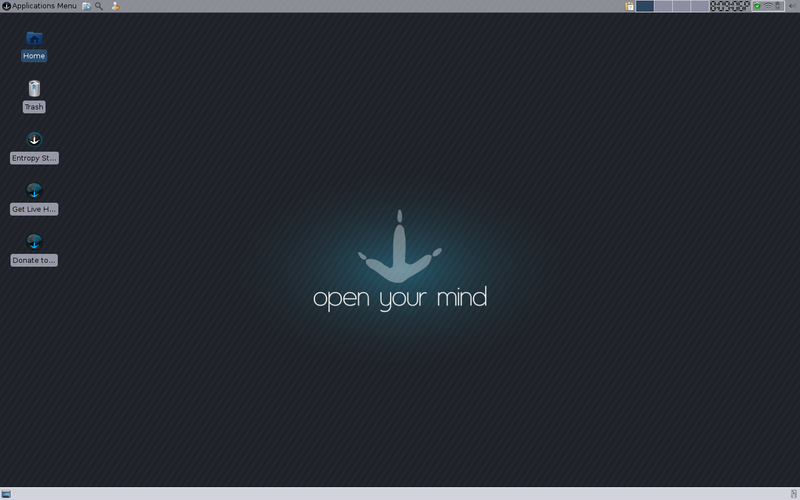 This time around, I’m reviewing Sabayon Linux 8 in its Xfce 64-bit edition. Honestly, I chose the Xfce edition because my USB stick is 2 Gigabytes, and the GNOME and KDE versions are too large to fit. But I can confirm that you can use UNetbootin to install Sabayon onto any laptop that lets you boot from a thumb drive. Sabayon is a distribution based on the Gentoo version of Linux. Gentoo is a long-established distribution that is one of the very few using source compilation to provide you with the software you install. While this allows you to customize your system to an unprecedented degree, it also requires the desire and the confidence to do much more “under the hood” work than most distributions expect. One of the aims of Sabayon is to make the initial installation of Gentoo painless, and they succeed in that. You start off with the Midori browser, the LibreOffice suite, a PDF viewer, 3 distinct terminals (I’m not sure why you get 3), Gimp (graphics program), Transmission (downloading torrents), Shotwell (photo manager), Ristretto (image viewer), Xchat, Cheese (a webcam application), Pidgin (an IM client), Exaile (music player), and a Movie Player. You also are given a number of accessories and system tools. The update notifier works well, and will prompt you to download the weekly Sabayon repos the first time. I gather that there are repositories updated daily, but the weekly one is used by default because there’s a lot more risk of breaking your system if you get updates from sabayon-daily. I didn’t have too many updates, and because Sabayon is a rolling release distribution, you shouldn’t have to re-install from a new DVD ever again just to get the latest software. A lot of people prefer this type of Linux distribution. Sabayon keeps quite up to date versions of the software it provides in the repositories. There are 2 methods to install or remove software in Sabayon: the primary way is by using their Entropy Store – in a similar way to Debian’s apt-get/Synaptic combination, Sabayon has “equo” (a very thorough command line tool) and “Sulfur”, which is the graphical front-end for equo. Sulfur starts by default in a basic configuration shown below, but also has some advanced tabs accessible by checking a box in the “Sulfur” drop down menu. Entropy installs binaries, like apt-get or yum do for Debian and Fedora respectively. If you prefer doing things the Gentoo way (and you really need to read all related documentation if that’s the case), you can use Portage – Sabayon has full support for Gentoo’s well-regarded tool for source-based software installation. There is a front-end that I found called Portato, but apparently its use is discouraged and it may not be well maintained. The community is careful to emphasize that these two methods (Entropy Store and Portage) are risky to use together unless you really know what you are doing. Generally, the Entropy Store is the preferred way to do things in Sabayon. 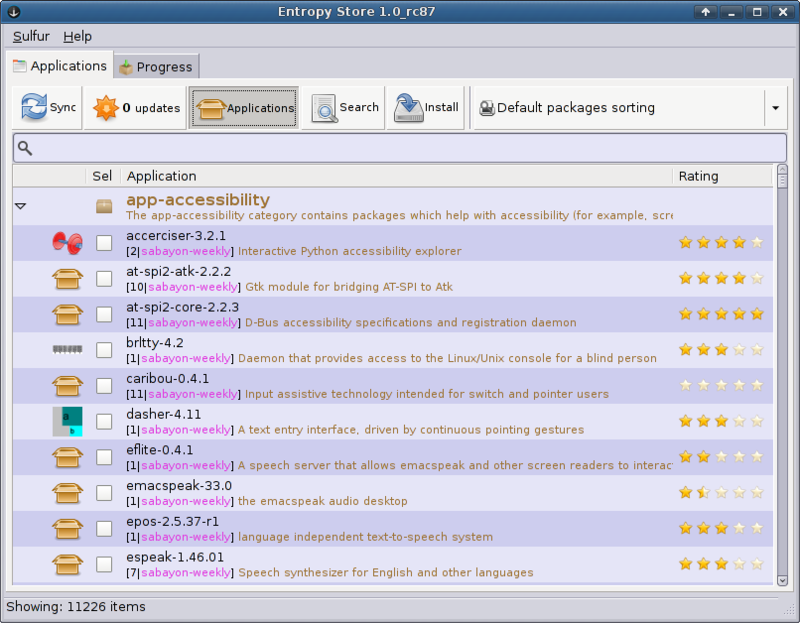 Although the Xfce edition installs a minimal set of applications at the beginning, the overall selection in the Entropy Store is very solid. There are over 11,000 items listed, which is pretty similar in size to most other distributions. Sabayon definitely supports dependency checking. One of the things I haven’t seen in other distributions was that in some cases, you are prompted to agree to licensing terms for various software. Although I wouldn’t consider this a newbie-friendly distribution, it’s ready for almost anything. Youtube, Hulu, and Apple Quicktime movie trailers play out of the box without any tinkering. Java (the “icedtea” version) and Wine 1.4 are also installed by default. The installed “Manage Printing” application is the CUPS web-based one, although if you prefer to use hplips (the HP tool), it’s available. In addition to the supported KDE, Gnome 3, and Xfce desktops you can install LXDE and the usual array of window managers. The implementation of LXDE in Sabayon is well done, definitely one of the best I have seen. Sabayon also has an unobtrusive notifier system that worked on both Xfce and LXDE, for finished downloads, letting you know updates are available, etc. I found it very useful. In addition, the Xfce “tips” tool is enabled until you turn it off, so you receive helpful information about using Xfce every time you log in. Just because this is more of a geek’s distro doesn’t mean it falls down in the gaming department. I found almost all of my favorite games in all genres – first person shooters, platformers, real-time and turn-based strategy, and emulators. Megaglest and Frogatto are two of the few games that I immediately missed. The one odd issue was that ordinary users are not part of the “games” group by default (is this due to its Gentoo heritage? I don’t know). In order to play games at all, you have to enter a terminal command! Luckily, the Entropy Store will always remind you after you’ve installed a game, and give you the correct command to enter (and you only have to run it once per user). The Desura cross-platform gaming client installed just fine and seems to work as expected. PlayonLinux is in the repositories, as is DOSbox. There is a front-end for DOSbox that I have never seen in any other distribution. The emulators I tried seemed to work well, but many of them are still command-line only (such as mednafen, and the Sega Genesis emulator Generator). However, the best ones for NES, GBA, and SNES do have graphical versions that work fine – and unlike Mint and Ubuntu, there’s a 64-bit version of ZSNES! Support for Sabayon is top notch. An icon on your desktop brings up the Sabayon webpage where you can connect to IRC. Or if you prefer, the Xchat client will connect you into the main Sabayon chat channel (you will have to change the nickname since it gives you “sabayonuser” by default). There is a main menu entry, “Sabayon”, which leads to 7 items: Download locations, Gentoo Documentation, Get Live Help, Report Bugs, Sabayon Git Repos, Sabyon Help Forum, the Sabayon homepage, and Sabayon Packages. The Sabayon main page has links to an informative wiki, a well-supported forum, and their bug tracker. In addition, you have the Gentoo forums and documentation to fall back upon – they also have a well-deserved reputation for helpfulness and clarity. When I used the Gnome desktop, there were occasional graphics glitches (my graphics card is an ATI), although nothing severe. I was mildly surprised to find that most of the window managers were bare bones – IceWM and blackbox had outdated and extremely sparse menus, as did Window Maker. Afterstep was the only window manager whose menus seemed to contain all the applications, including games, that LXDE and Xfce had. Printing was an issue for me – I am not familiar with the CUPS web interface, and neither it nor the “hplip” software were able to detect my wireless all-in-one printer from HP. I am sure that with some work I can get it connected, but I didn’t want to dig into solving it. This was one area where Sabayon probably works fine, but expects a little more effort than some people want to expend. I wasn’t able to get DVDs to play in the provided Movie Player; I suspect my laptop is at fault because all the necessary libraries are installed in the system for you. 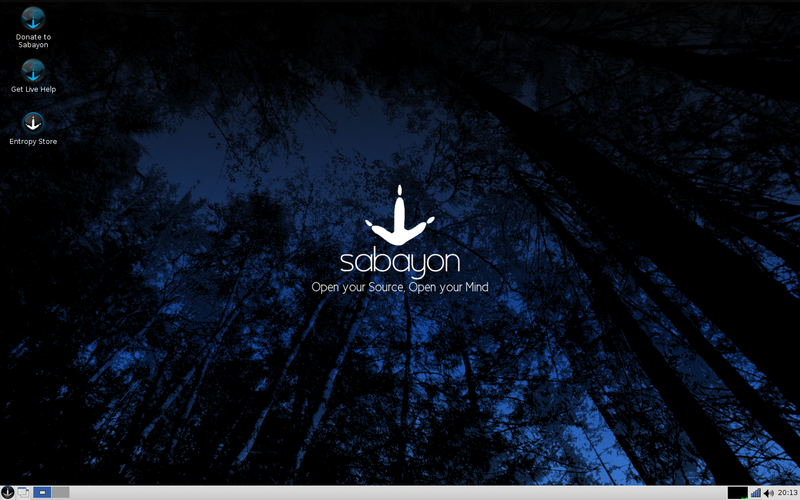 Overall, Sabayon Linux is a very high quality distribution, and I like it a lot. But I can’t help feeling that for someone who just wants to use their system without needing to learn a lot, Sabayon would not be a good fit in the long term. The community, and the maintenance you do, seem to encourage users to really be more aware of the ways their system works. This isn’t a criticism – like Arch Linux, Sabayon (and Gentoo) focus on providing a very usable distribution that happens to cater to people who want to understand Linux better. Lovely review. Good work 😀 ! Spoonfed Linux distros are OK for quick introductions to the *nix world but when you start asking things from your OS Sabayon really outshines the usual Ubuntu install. Gentoo is such a powerful system that with a bit of learning reaps serious rewards, Sabayon tames this learning curve with Entropy (the package manager using equo/sulfur for shell/X use) Using both Portage and Entropy side-by-side causes no issues and makes Sabayon what I think is the most powerful mainline distro today. Gone is the bulk and it feels more “Gentoo” and slender with the aim of broad compatibly and performance. Great review, you have be subscribed! I’ve been using Sabayon for a couple of years, but KDE rather than one of the lightweight versions. *most* of the time it does just work – the one exception seems to be with printing, where the users has to locate and install HPLIP for themselves (not ideal if you don’t know you need it and the OS reports the printer is connected and working!). It can also be a bit slow in KDE flavour – definitely NOT the version for an old low spec machine. Sabayons strength is also it’s weakness. It’s a rolling distro, and likes to stay cutting edge, but at the price of stability and occasionally breaking after updating. This is good training to remember the need to stay backed up! I’ve tried several other distros, major players like openSUSE, Mint, PCLOS and Fedora as well as minor distros like AVLInux and Pear, but always end up coming back to Sabayon. Ironically I’m currently back on Pear (because I happened to have it installed on a spare system) after the latest updates caused issues with KDE, and debating whether to reinstall or try something else for a bit. Thank you for spotting some issues, we are working on them. In particular, I found the “games” group thing pretty annoying, and already opened a bug report about (http://bugs.sabayon.org/show_bug.cgi?id=3134). Stefan, I am now slightly confused. 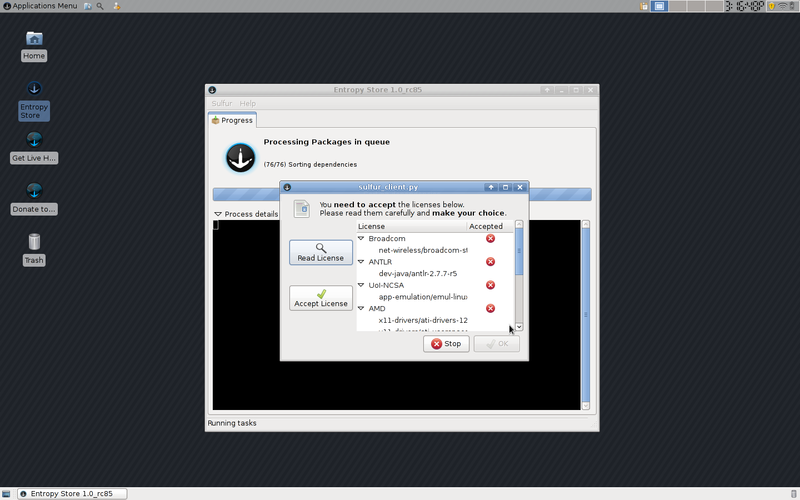 I just installed a copy of Sabayon 8, in a VM, so I could double-check what I remember happening. I installed the “aisleriot” game package, which I can play with no problem. However, I next installed all updates, and after that installed both “adom” and “naev”. They won’t run. You get an error message that talks about ‘permission denied for child process “naev” ‘, and trying to run Adom also results in a “permission denied”. At that point (running Sabayon in VM), I had not yet run the terminal command that Entropy tells you to run in order to use the “games” group. I can only assume that for at least some games, the issue remains for now. I don’t get it. Isn’t the whole point of Gentoo that everything is compiled and optimized for your specific system? Why would you use a Gentoo-based distro if you aren’t going to do that? It seems like a lot of work with little reward. Canageek, I can’t really answer that question. I’m sure that the developers of Sabayon have been asked that. It depends on each individual and what he or she wants in a Linux system. What I do know is that Sabayon ran very well for me, and seemed to be quite capable. It’s definitely one that I will return to in the future.